Find free garden landscape apps, software and planners. You can grow your own food! Cultivating a small vegetable garden is not difficult if you plan your garden layout carefully and a few important factors are kept in mind. The primary needs for successful vegetable garden planning on a small scale are the same as those for gardening on a large scale. In designing a small garden layout greater emphasis must be placed on intensive cultivation and arranged plant rotations so every available space will produce the maximum yield. The essentials of all gardening include soil of suitable texture containing available plant food, water to dissolve the plant food so that the plant rootlets may make use of it, seeds or plants which will produce the desired crops, sunshine and warmth to bring about germination and plant development, and cultivation. Planning a garden from scratch successfully also depends upon the gardener and the care he bestows on his project. In planting a vegetable garden, there are several ways to use your computer or iPad to plan, space and rotate crops. The great advantage of a vegetable garden planning tool is that you can quickly create a color plan with 3-D views and you have the ability to make changes in a snap. Not everyone has the horticultural expertise to choose plants and arrange them for best results, but with a vegetable garden planner such as Better Homes & Gardens Plan-a-Garden you can try out this option. Choosing suitable free trial vegetable gardening software will also help you create the best possible plan for your vegetable plot, allowing you to save both time and money. 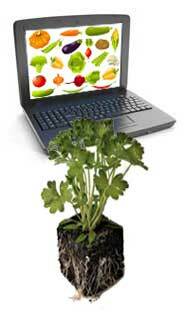 One of the features you should consider when searching for vegetable garden software is a “when-to-plant” guide. Garden software can also keep track of your vegetable garden plans year after year, which is especially helpful when rotating crops. The GrowVeg.com Garden Planner shows how much space plants require and how to group them for maximum success, removing the need to look up planting distances and crop families. The first step in small vegetable garden planning is to select a well-drained plot of good soil. Location and exposure cannot always receive much consideration in gardening small plots since there is ordinarily little room for choice. Such spaces are usually located in backyards or the choice of location is restricted in other ways by the necessity that the garden be accessible to the house, garage or shed. Take into account when planning a vegetable garden layout that frost is less likely to injure vegetables planted on high ground than those planted in low places or valleys where the heavier cold air commonly settles; and that crops will mature more rapidly on land that has a sunny southern exposure than on other plots. Moreover, the garden design should be fairly level, but well drained; and that a warm, sandy loam will produce an earlier crop than a heavier soil that retains more water and less heat. 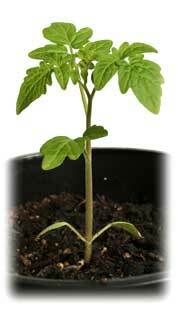 Plant your home garden in an artistic manner, but keep it in such shape as to make cultivation easy. Make the soil deep, mellow and rich before the seeds are sown. Time and labor will be saved. Spade or plow the ground deeply, at least 8 or 10 inches. This loosens the subsoil so that it will hold moisture and the tiny plant roots can penetrate it. Work a good fertilizer into the soil as you prepare the seed beds. If you do not wish to fertilize all the ground in the plot, fair success can be had and fertilizer saved by working it into the soil only under the seed rows at the time of sowing, or under seedlings when transplanting them. Rake the surface frequently to keep down weeds and to prevent the soil from baking. Radish seeds sown with celery or other slow-germinating seeds will come up quickly, breaking the crust and marking the rows. Along one side of the area rows of bush fruits may be planted. About the borders of the vegetable garden is a good place for flowers to be grown for the decoration of the house or to give to friends. When planting vegetable garden seeds, follow the instructions faithfully as to the depth they are to be covered, and firm the soil on them with the flat side of the hoe. Some seeds can be spaced in the trench the distance they are to grow, while others must be sown at least twice as thick as they are to grow and must be thinned after the seedlings are ½ inch or so in height. Remember, however, that due to climatic and soil conditions, some localities are unsuited for growing certain types of vegetables. Inquire from those who have grown gardens in your neighborhood as to the kinds of vegetables to plant. In general, you can follow the instructions on the seed packets regarding planting time and culture. When the instructions state that the seeds can be sown as soon as the ground can be worked in the spring, do just that. Vegetables of this type will not be affected by light frosts and must be planted early because they either require a long time to reach maturity, or grow best during cool weather, making it necessary that they have time to reach maturity before hot, dry weather starts. Always have way too many vegetables or not enough? 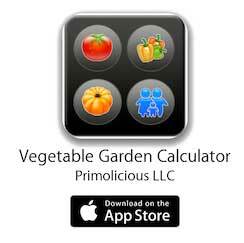 The Vegetable Garden Calculator for the iPad or iPhone will come to your rescue! When planning your garden one of the most difficult things to determine is how many plants of each vegetable to plant. This free planner will help show you the average number of plants you need to feed your family. These are just average numbers so if you really like a certain vegetable feel free to plant double or triple the amount. The Vegetable Garden Calculator covers over 90 vegetables and herbs. For each one they tell you how many you need to plant to feed your family and also provide expanded yield information for several of the plants. This vegetable garden planner is a great way to plan out your vegetable garden and insure you aren't planting too many or too few vegetables.